It’s been a lovely warm and sunny day! Such a shame to be at work, sitting in an office working at a PC. However – when I came home I had two packets full of growing potential lying on the doormat. SEEDS! Mine were mail order from Dobies of Devon and Sarah Raven’s Kitchen Garden. Before I opened the envelopes I went outside to see what was ‘happening’ in the garden. Very pleased to see that my crocus bulbs have flowered – dark purple, light purple, white, yellow and a lovely white and purple. A really good start to the ‘wild’ part of the grass. Also there were crocus flowers at the edge of the slate path right next to the raised beds. Surprisingly these are on the north facing side of the garden. They look bright and cheerful and really brighten things up. Back indoors to look at the seeds! Packets are rather large… how many have I ordered….? Also how and where am I going to sow them! At least some of them can be sown directly outside, probably in May. Spring – I’m ready whenever it arrives! Enjoy your seed ordering / sowing / planting / planning! The showers are blowing along quickly and everywhere is so wet. The low sunlight through the black bamboo does look lovely though. Its not a good idea to walk on clay soil (which is heavy enough anyway) so to get to the ‘wild’ corner and the pond I walk across the grass and just stick to the stepping stone path. I’ve seen spring flowers in other people’s gardens but only have one small clump of snowdrops here. Perhaps I need to split the clump up after they have flowered…? I have some green shoots that may be grape hyacinths but no sign of flowers to give me a clue. I really should have put some plant labels in the ground rather than trying to remember where the bulbs are. I have a small success through! 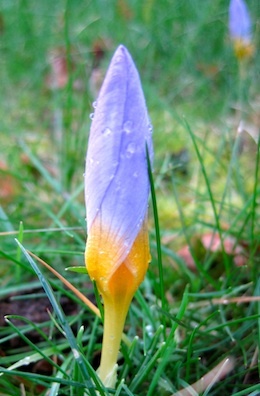 I planted bulbs in the ‘wild’ part of the grass and today noticed that the spring crocus is about to flower! So far I have four flowers (not a great show, I know) and checking back in my scrapbook I see that I bought 35 ‘snow crocus’ bulbs which are a mixture of purple, light purple, yellow and white. So far, my 4 flowers are purple but I’m quite happy that they have grown! The picture isn’t the most exciting but I think it is a good start to the ‘wild’ patch in the garden. I also have other bulbs shooting up, these are the alliums that I planted last autumn. I’m rather confused by this, it is far too early in the year for these isn’t it?